God's glory is revealed all around us, if we have eyes to see, ears to hear and hearts to understand. In March I took a three day workshop with Jason Tako, held at my gallery. It was such a great time of learning and discussing all things painting! Jason is not only a great teacher and an outstanding artist, but is a truly caring individual who took alot of time with every student and helped us with all our questions. 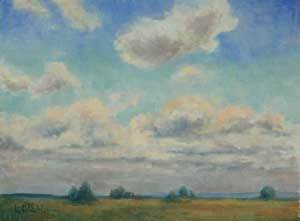 I chose to work on this study of clouds. I enjoyed all the nuances and colors within the cloud structure and the essence of the beauty of the heavens. The Susuehanna Valley Plein Air Painters, of which I am a member, will be exhibiting at the Carlisle Arts Learning Center (CALC), which is located on Hanover Street in downtown Carlisle, PA. Above are the two pieces of work I will be showing at the exhibit. Just to show that I have been painting this season, I am posting two in one day. Last week I finished up this painting that I started last year. I rarely complete the plein air paintings in one session - although sometimes it does all come together, so I am thrilled when I can go back out - even a year later. We painted at Ft. Hunter Mansion and were also asked to demonstrate that day for a group of youth who were kayaking and canoeing on the Susquehanna. They stopped there for lunch and joined us in a paint-out of their own, after a brief demonstration by the president of our group, Susquehanna Valley Plein Air Painters. Turned out that the Harrisburg Camera Club showed up as well and took photos. Saw my picture on PennLive, the Patriot News website. 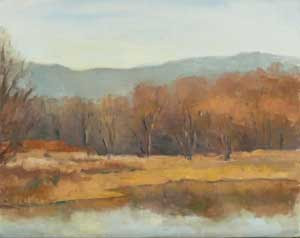 The first plein air painting session of 2011 for me was at the end of Winter at the Wildwood Lake. 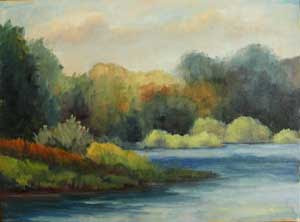 I love to paint there at different seasons, because it changes so dramatically. Not everyone was thrilled by the winter dead grasses and leaves, but I loved the pallette of subtle grays that I saw. Much better than greens for me! Though the politics in the city of Harrisburg are in upheavel, the beauty of a city skyline remains intact. We painted from the West Fairview boat launch over the past two weeks and this is the little piece I finished. I've been wanting to do the skyline for a while. Almost miraculously, we saw a majestic golden eagle riding the wind above us the first day. They are not normally seen in these parts - but it must have been travelling through. What a wingspan! Scripture tells us that, "they who wait upon the Lord shall renew their strength. They shall mount up on wings as eagles." If only the city would take a lesson from that eagle soaring over it -- to wait on the Lord and allow Him to move among the decision-making. That's what I was thinking while painting. 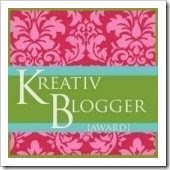 I now belong to three blogs and have inadvertantly "forgotten" to post to my own. 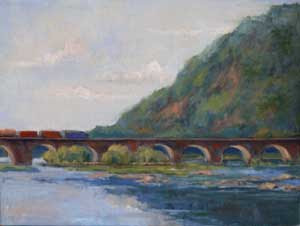 The Daily Painters of Pennsylvania and The Susquehanna Valley Plein Air Painters both have blogs now and are starting to exhibit as groups around Central Pa. It's been wonderful meeting other artists and posting our work together. So, I did fall behind on posting to this blog. I'm making an effort now to come back and continue this blog because this is also a journal of my art journey and I feel it necessary to express myself in writing as well as on canvas. Last week we painted in Amity Hall at the boat launch. It was a brisk, windy day - exhillerating compared to the heat of this past summer. We saw a bald eagle flying above and two great blue herons soaring over the waters. 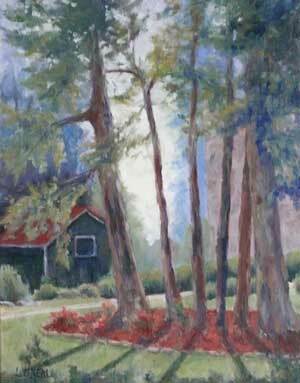 I completed this piece on site - maybe a few touch-ups are required but it is mostly finished. The light was changing every minute due to the thick, fast moving clouds. But every now and then the sun would shine and hit the trees and plants - which is what I tried to capture very quickly here. I'm pleased with this piece - it's loose with almost a watercolor feel. It says what I hoped to say. It was a beautiful morning in Liverpool, PA when a few of us journey up Rt. 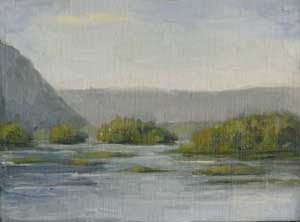 11/14 to Liverpool to paint the lovely view of the Susquehanna River. 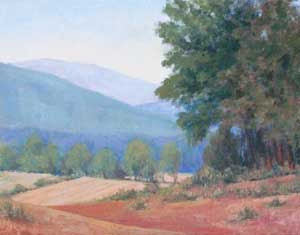 We had respite from the heat for one day with a nice breeze and perfect plein air conditions. There was a morning haze hanging around but that just made this little scene all the more special. I really enjoyed painting that day. We then ate lunch at a cozy little restaurant and talked about our artistic journeys. I'm thankful for those little moments in time that fill your senses. I am the owner of Art & Soul Gallery in Lemoyne, Pennsylvania. 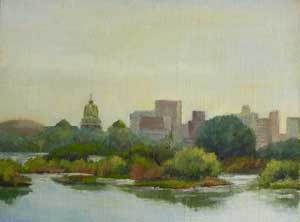 My works and 35 other local area artists works are exhibited and available for sale at the gallery. Contact the gallery at 717-761-1270. We are located on the second floor of the West Shore Farmer's Market. Please visit and consider the beautiful original works by Central Pennsylvania artists. After a career in business, I couldn't shake a lifelong desire to create art. In 2003 I began this wonderful journey of painting and sculpting. There is so much to learn and always new ways to improve and grow as an artist. 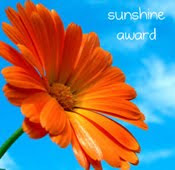 In my small way, I hope to show the glory of God all around us.